City, University of London welcomed Katharine Viner, editor-in-chief of Guardian News and Media, to speak as part of Women in Journalism’s In Conversation series. One of the few women to have edited a national newspaper and the first to edit The Guardian, Katharine discussed her career path, the future of the paper and her advice for aspiring journalists. She was in conversation with Marjorie Deane Professor of Financial Journalism at City, Jane Martinson, who is a Guardian journalist and a former Chair of WIJ. The reader revenue model really supports The Guardian and 50 per cent of our revenue is now from readers rather than advertisers, although advertising is still very important to us. It’s also a really rewarding way to be funded - by the people who value your work most. We endeavour all the time to become more diverse, not just to tick boxes, but because I think you need to be representative of the places you’re reporting on and the communities you’re reporting on if you’re going to get the right stories, if you’re going to get the best stories, if you’re going to hear what’s really going on. Jane Martinson asked about how she tackled leading a news organisation during a time of significant global uncertainty and against the backdrop of Trump’s election, Brexit and mistrust of the media. Katharine explained she looked back at the history of The Guardian and the reasons why the newspaper was launched in the first place. “I thought what we need, at this point for The Guardian to be, is hopeful. “There’s this great book that inspired me by Rebecca Solnit called Hope in the Dark and she said authentic hope requires clarity and imagination. I read that, and I thought, what more could you want from a news organisation at this point than clarity and imagination to produce hope? There’s really concrete skills that you can learn, particularly about how to use data - how to read a data set, how to go through it and how to spot a story in it. The whole world is turning in to data so that’s a big, tangible thing you can learn. In terms of personal skills, I think it’s learning how to get someone to open up to you and tell you the truth when perhaps they don’t really want to, but know they should. Another question from the audience asked whether a reliance on reader contributions might have an influence on the editorial direction of the organisation. “We worked out over many decades how to make sure advertisers don’t influence the journalism”. “I think it’s great to have readers funding the journalism - we know what they give us money for and it’s the most serious stuff. We do a lot of reporting at The Guardian on the environment, they like our Trump coverage, or science and health – it’s all the most serious stuff. “And that’s why we exist. We exist to hold the powerful to account, we exist to contextualise and understand the world and that’s what our readers tell us they appreciate”. 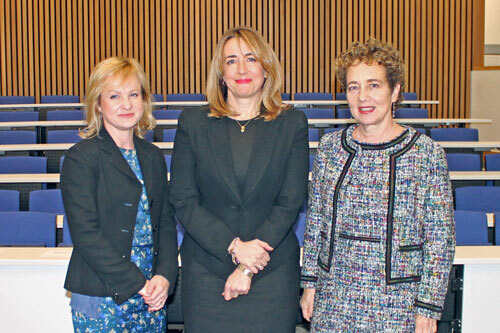 “The Journalism department was delighted to welcome such a distinguished speaker who is a fine role model for our students and in particular our female cohort”. Women in Journalism is a networking, campaigning and training organisation, providing guidance and support for women working in print, broadcast and online media at every stage of their careers. Founded 25 years ago by pioneering female editor Eve Pollard, they now have a membership of 650 and provide guidance, mentoring and sponsorship for female journalists.